Michaela painted this picture today at school during art time. Her class is studying an American Artist each week and after they learn about the artist, they then have to paint a picture in the style of that week's artist. This week the painter was Georgia O'Keefe! 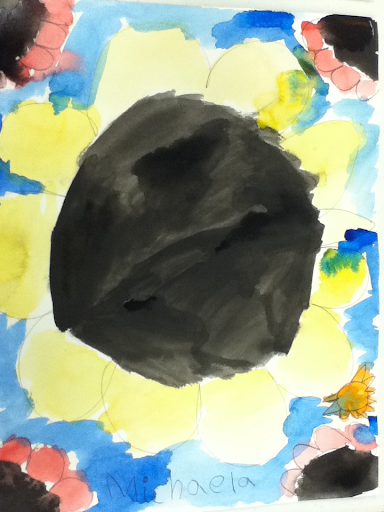 I love Michaela's scale, colors, and concept of her Sunflower picture! I love this picture...you could frame it for Mom Mom for Mother's Day and I would be thrilled. But, I will understand if you want to hang it in your house. It is really good.